2012 년은 이노비에게 너무도 감사한 한 해였습니다. 1년 동안 총 27번의 아웃리치 공연을 통해 전라남도 완도, 서울, 뉴저지, 브롱스, 퀸즈, 맨하탄을 찾아갔고, 장애를 가진 분, 병원환자, 암환자, 한국 다문화 가정 모임 등 소외되기 쉬운 계층의 3세부터 모든 연령층의 약 3700분들과 소중한 만남을 가졌습니다. 이노비는 어려운 분들을 찾아가 그 분들과의 소통을 통해 행복한 세상을 만들어 갈 수 있다고 믿습니다. 2013년 새해가 밝았습니다. 올해 이노비는 50회의 아웃리치 공연 계획을 가지고 문화적으로 소외된 6,000여분들에게 찾아가려고 합니다. 2012년보다 더 많은 곳에서 웃음과 사랑이 넘치도록 열심히 뛰겠습니다. 새해에도 여러분 가정에 행복이 가득하시길 기원합니다. 또한 여러분 주위의 소외된 이웃을 둘러보시고 그분들과 함께 하시는 한 해가 되시기를 바랍니다. 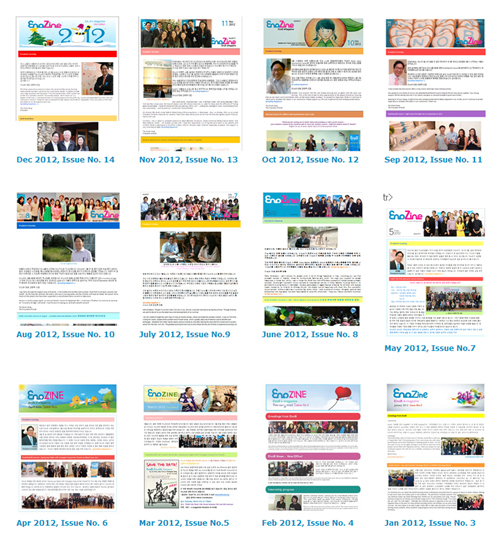 2012 has been a great year for EnoB. 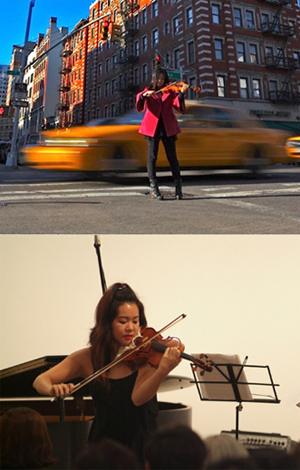 In 2012, EnoB had a total of 27 outreach concerts in Wando, Seoul, New Jersey, Bronx, Queens, and Manhattan. 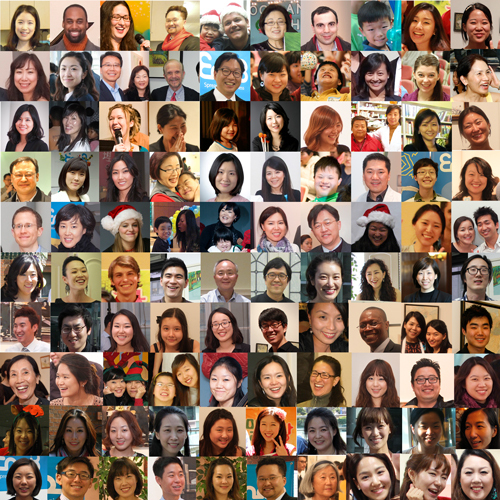 We reached out to about 3700 people in all age groups, including those with special needs, hospital patients, cancer patients, and Korean multicultural families, and help lessen feelings of loneliness and isolation. We are thankful for the opportunities that we have been given this year. EnoB wishes you a happy and blessed new year to you and your family. May 2013 bring you joy and happiness and to the people around you. 이노비는 지난 12월 14일 뉴저지 홀리네임병원을 찾아가 암환자와 가족분들 80여분을 위한 음악회를 열었습니다. 공연 동영상을 보시려면 왼쪽의 사진을 클릭하세요! Click to view the concert video on the left side! 평소 많이 접해보지 못하는 흥겨운 음악회에서 60명의 장애인과 가족들이 즐거운 시간을 가졌습니다. 60 people with disability and their families had a pleasant time at the cheerful concert which they couldn’t have much opportunity to enjoy. 이노비 서울은 지난 12월 17일 서울대학교 어린이 병원을 찾아가 입원 중인 어린이 환자와 가족 130여분을 위한 콘서트를 열었습니다. 이 날 공연은 롯데리아의 후원으로 이루어 졌습니다. EnoB Seoul visited Seoul National University Children’s Hospital on December 17th, 2012 and held a concert for young patients and their families (about 130 people). The concert was able to be held with the support from Lotteria. 이노비의 새로운 뮤직 디렉터 주디 강을 소개합니다. 이번 겨울부터 이노비의 뮤직 디렉터로 세계적인 바이올리니스트 주디 강이 함께하게 되었습니다. 주디 강은 그 동안 다수의 아웃리치 콘서트와 지난 9월에 열린 베네핏 콘서트에도 이노비의 뮤지션으로 봉사해주셨습니다. 지난 12월 9일, 주디 강은 세계적인 작곡가이자 피아니스트인 류이치 사카모토와 함께 트리오로 세종문화회관 대극장에서 성공적인 공연을 마쳤습니다. 세계적인 바이올리니스트로서의 그리고 앞으로 이노비의 새로운 뮤직 디렉터로서의 주디 강의 멋진 활약을 기대합니다. We are pleased to announce the appointment of world-renowned violinist Judy Kang as a new music director for EnoB, starting this winter. Judy Kang has volunteered to perform in numerous outreach concerts, including EnoB Benefit Concert held in last September. On December 9th, Judy Kang performed in Grand Theater Sejong Center for the Performing Arts, as part of Ryuichi Sakamoto’s piano trio. We are happy to have Judy Kang as a new addition to our EnoB music directors and looking forward to seeing more of her wonderful performance. 한국에서 이노비 서울과 함께 재능을 기부하고 계신 소프라노 안수경 선생님을 소개합니다! 안수경 선생님은 줄리어드 음대 성악과에서 학사와 석사 학위를 취득하고 전문 성악가로 활동을 시작하셨습니다. 뉴욕의 많은 오페라 무대에서의 성공적인 공연을 마치고 한국에서 귀국독창회를 마친 후 현재 서울종합예술학교 성악과에서 전임교수로 후학들을 양성하고 계십니다. 안수경 선생님은 지난 11월 6일에는 세브란스 재활병원에서, 12월 17일에는 삼성서울병원 한가족의료봉사회의 성탄 모임에서 재능 기부로 참여해 주셔서 아름다운 노래로 환자분들의 뜨거운 박수를 받으셨습니다! 평소 음악을 접하기 힘든 분들께 음악을 통해 메시지를 전하는 일을 이노비와 함께 하게 되어 기쁘다고 하시는 안수경 선생님과 함께 이노비는 앞으로도 많은 분들께 행복을 전달하겠습니다. Having received Bachelor’s and Master’s degrees from the Juiliard School, Soo Kyung Ahn is a professional soprano soloist with diverse experiences singing opera in New York City. After her homecoming solo recital in Korea, she is now a professor at the Department of Vocal Music in Seoul Art College. 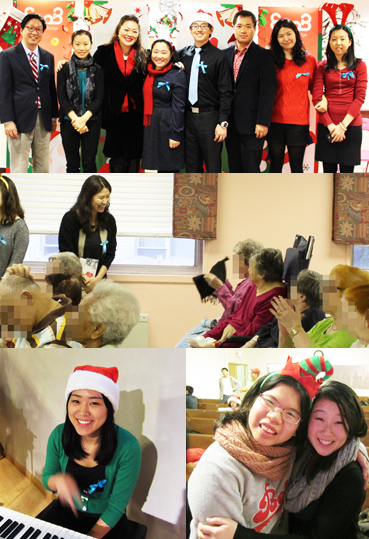 Ms. Ahn volunteered to share her talent and received acclaim at the outreach concert in Yonsei University Severance Hospital on Nov. 6th and at the Christmas performance in Samsung Medical Center on Dec. 17th. Ms. Ahn shared that she is happy to work with EnoB to spread a positive message through music. Along with her, EnoB will continue to bring hope and spread happiness to more people in need. 이노비에서 인턴으로 근무하고 있는 이승연님과 염민지님을 소개합니다! 이승연 님은 현재 이화여자대학교 국제학부 3학년 재학 중으로, 교환학생 프로그램을 통해 NYU에서 공부하고 계십니다. 평소 비영리 단체의 활동과 운영방안에 깊은 관심을 갖고 있었던 승연 님은 예술 문화의 중심인 뉴욕에 있는 동안 뜻깊은 활동을 하고 싶어 인턴을 시작하게 되었다고 합니다. 염민지님은 미국 버클리 음대에서 Music Business를 전공한 후 한국으로 돌아와 공연기획자가 되기 위한 준비 중에 있습니다. 11월 서울아산병원 아웃리치 공연에서 발룬티어로 참여한 염민지님은 처음 만난 이노비언들의 친절함이 인상 깊었고, 이노비와 함께 보람찬 일을 하고 싶어 인턴을 시작하게 되었다고 합니다. 이노비에서의 인턴 경험이 뜻깊고 보람 있는 시간이 되길 바랍니다! 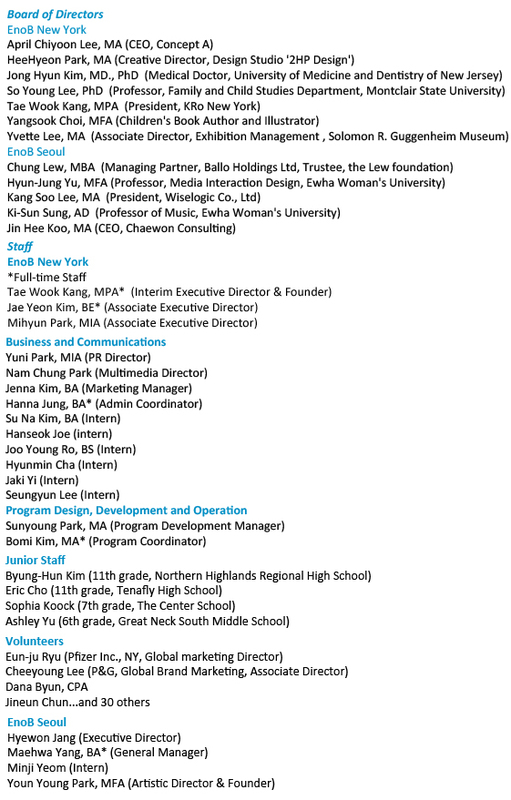 Introducing EnoB s new interns, SeungYun Lee & MinJi Yeom! Seungyun Lee is a junior in Division of International Studies at Ewha Womans University and currently studying in NYU as an exchange student. During her stay in New York, Seungyun wanted to do something meaningful and decided to intern at EnoB. We hope that her internship with EnoB will be an incredibly rewarding experience! 정 인욱 복지재단에서는 이노비의 2013년도 아웃리치 활동을 위해 1,000만원(약 900 USD)을 후원해 주십니다. 이 후원금은 시각장애인을 위한 공연 2회를 포함, 2013년도에 한국에서 열릴 아웃리치 공연을 위해 사용될 예정입니다. 정인욱 복지재단은 1993년 12월 설립 후 사회복지 분야에 많은 지원을 해왔으며 2005년도부터는 시각장애인을 위한 다양한 서비스를 개발하여 지원하고 있습니다. 이노비는 오는 2월 서강대학교에서 주최하고 정인욱 복지재단에서 후원하는 “시각장애학생들을 위한 영어캠프”에서 캠프참가자들과 교사, 봉사자들을 위한 아웃리치 콘서트를 개최합니다. 여러분의 많은 관심 부탁 드립니다. 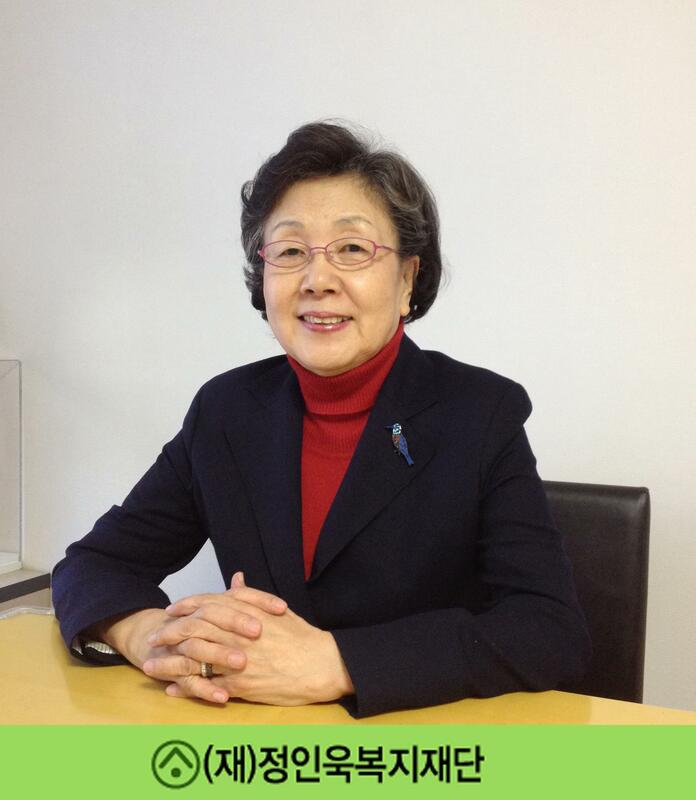 Chung In Wook Human Service Foundation will make a donation of 10,000,000 KRW (9000 USD) to EnoB. This donation will be used for future outreach concerts in Korea in 2013, including two concerts for visually impaired individuals. 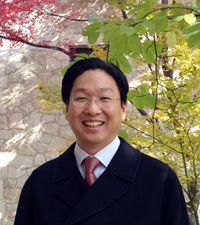 Since its establishment in December 1993, Chung In Wook Human Service Foundation has made a tremendous contribution to social welfare services. In February, EnoB will join English Camp for Visually Impaired Students, sponsored by Sogang University and Chung In Wook Human Service Foundation, and hold an outreach concert for participants, teachers, and volunteers. Your support will be greatly appreciated. Over the last five years, EnoB has spread happiness to 2,000 program participants, and that number continues to grow! Of course, the musicians, artists, staff, and board members at EnoB do their best to fulfill their roles, but we couldn’t succeed without donors and volunteers. EnoB can only function with your donations. So, PLEASE, Join us to Spread Happiness in the world! 기사를 보시려면 아래 링크를 클릭해주세요! 연대의료원과 서울아산병원 회지에 이노비 소식이 실렸습니다! 이노비 겨울 해피니스 스크린을 소개합니다! 이 번 겨울, 이노비와 함께 할 이노비 겨울 해피니스 스크린 입니다. 겨울 홀리데이 느낌이 물씬 나는 이번 디자인은 이노비 디자인인턴 조한석님께서 수고해주셨습니다. 이노비 겨울 해피니스 스크린과 함께하는 따뜻한 겨울 되시길 바랍니다. 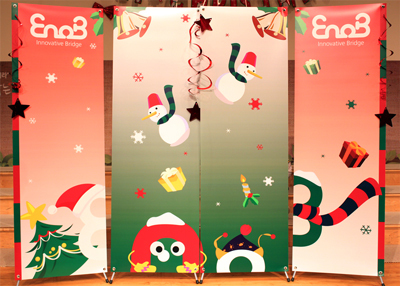 Introducing EnoB Happiness Screen for the winter! EnoB Happiness Screen is a playful backdrop for EnoB's outreach concerts. It is a visually playful element that connects with our audiences and sets a seasonal tone. We are happy to introduce our winter EnoB Happiness Screen! EnoB Design Intern Han Seok Joe shared his talent and designed this playful winter holiday scene. 문의는 이메일(enobinc@gmail.com) 또는 전화(212-239-4438)로 해주세요! 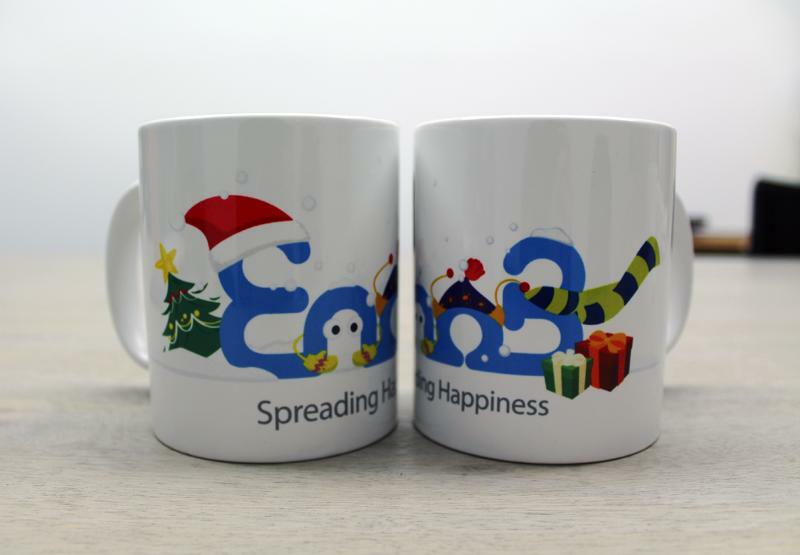 EnoB's limited-edition mug for the winter is now available. 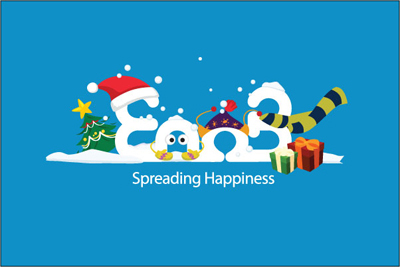 Many people helped EnoB's spreading happiness. All of EnoB’s works were able to be done by sponsors. Thank you very much for your support. 이 노비언들의 웃는 얼굴이 담긴 EnoB Smile Block을 만들고 있습니다. 여러분의 행복한 모습을 담아 더 많은 소외된 분들에게 나누고자하는 이노비의 마음이 담겼습니다. 이노비언 여러분의 활짝 웃는 사진을 보내주세요. 여러분의 웃는 얼굴이 쌓일때마다 이 세상에 나눠지는 행복이 조금 더 많아질 것이라고 저희는 믿습니다! EnoB is making EnoB Smile Block, which is made of EnoBians' pictures with smiling faces. Send your pictures to us at happiness@enob.org. EnoB believes that your happiness will be spread to others in the world! 위에서 소개된 4번의 콘서트외에도 12월에는 4번의 아웃리치 콘서트가 있었습니다. 삼성서울병원과 은혜가든 그리고 뉴저지 밀알과 드윗양로원에서의 행복나눔 콘서트에 대한 내용은 2월호 이노진에서 보다 자세하게 소개해 드리겠습니다. Besides, in December, there were 4 more concerts, we will introduce other news in the February issue of EnoZine. 1월 24일에는 브롱크스 저소득층 장애어린이를 위한 콘서트가 2회 준비되어있습니다. 2월 15일에는 NYU Langone Medical Center에서 여성장애인들을 위한 콘서트가 마련됩니다. 2월 2일 서강대학교에서 시각장애인들을 위한 콘서트와 2월 14일 삼성 서울병원에서의 공연이 마련되어있습니다. On Janurary 24th, there will be 2 concerts for low income children with disabilities in Bronx. Please cheer for our activities!